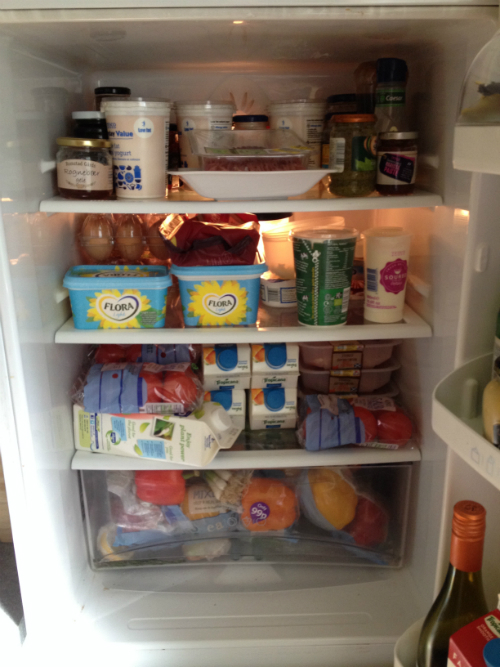 Students are returning to Edinburgh this week, so our fridge looks like this in anticipation of hosting a load of them for lunch on Sunday. Our cupboards are in a similar condition. Are you fitter than a Premier League footballer? Probably not, but Mark Bailey has the tests you can do to find out for yourself. Jen Pollock Michel issues a rallying cry to parents to stop their children from thinking that life is a race. I know I posted a response to Richard Dawkins' asinine comments about Downs' Syndrome last week, but Simon Barnes is a wonderful writer, and his payoff line deserves a mention: "It’s a shame that Dawkins wasted his title The God Delusion for his fundamentalist tract. He should have saved it for his autobiography." Is reading the news bad for you? Rolf Dobelli explains why it could be. Better to stick to blogs, eh? But seriously, read more books. Justin Taylor is compiling a list of "novels every Christian should consider reading." It's careful titles like the one above which give pedantry a bad name, but we really do need to think more carefully and react even more slowly, as Andrew Wilson argues. On similar lines, David Brooks lists the virtues needed to be a good thinker.